OTHER SIDE: Sometimes We Must Protect the West from Itself? | RANGEfire! According to an opinion piece by Adam Sowards published in High Country News, Sometimes We Must Protect the West from Itself. NOTE: In the West, there is an old saying to the effect that: “good fences make good neighbors.” At RANGEfire! we acknowledge our virtual neighbors on this virtual landscape. We acknowledge that there are always at least two sides to every story. When what is being said is clearly on the “other side of the fence,” we will try to acknowledge that, to make it clear that we are simply passing along what others are saying about the issues and subject matter that we talking about, even when it does not reflect our views, and may in fact be the polar opposite — which is why it is from the other side of the fence. But we think it is important for people to have an opportunity to hear the other side of the story, and know what others are saying about these issues. Sowards goes on: At the recent GOP convention, the party faithful approved a platform that directs Congress to give “certain public lands” to the states. It’s an old strategy, trotted out like a broken-down show horse at a county fair. Bishop and his supporters like to tout their Utah Public Lands Initiative, which includes an alternative that they call the Bear Ears National Conservation Area. The bill’s proponents like the collaborative process it enacts, yet the initiative in its flexible management plans clearly favors grazing and energy producers. The Nature Conservancy, long a partner in the process, recently announced that it cannot back this bill. In addition, the Bears Ears Inter-Tribal Coalition, representing dozens of tribes, has declared that it wants the area protected by a national monument. 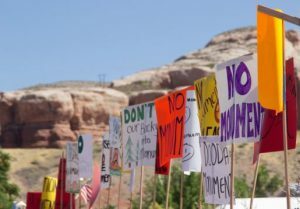 Meanwhile, Bishop has proposed a “Partner Act” that would end the president’s power to use the 110-year-old Antiquities Act to create a national monument for the Bears Ears area.